These Thunderbird Wire wheels are made in the USA, and are guaranteed to be true and round. The design features 56 stainless steel spokes, attached to an all steel rim, and a steel hub. 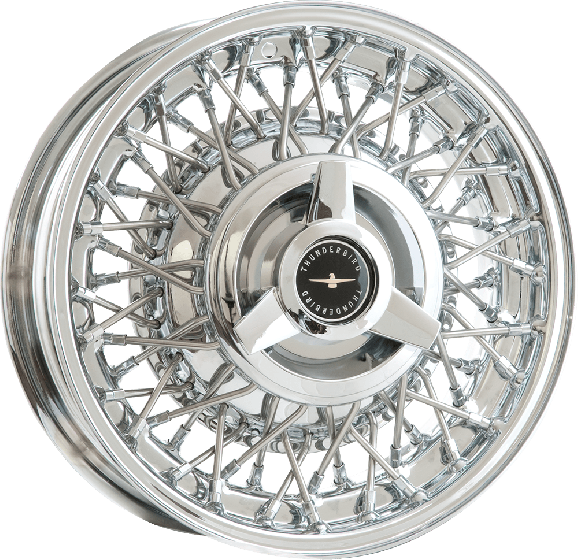 Designed to fit 1955 to 1967 Ford Thunderbirds in sizes ranging from 14x5 to 15x6 inches with a single 5 x 4 1/2 inch bolt pattern. The lip-laced design requires a tube, but the wheels come ready to bolt onto your classic Thunderbird. No truing is necessary, and you can choose from a stylish variety of the optional three-bar spinner center caps (Accessories sold separately). All Thunderbird wire wheels are treated to a triple chrome-plated finish, with polished stainless steel spokes. Wire Thunderbird Wheels are warranted for a period of three (3) years from date of purchase against defects in materials and workmanship excluding the finish. The caps we carry are fairly shallow, but if you have any doubts, you may order one cap to test fit. Then, you may check the cap for clearance with your skirts on either side and if all is well, simply order the rest of the set. If for some reason the fit is not satisfactory, you may return the cap as long as it is in like-new condition. The 1966 Thunderbird originally had 15x5.5 wheels, which we would replace now with 15x5 wheels. All of our vintage, reproduction wheels have original spec backspacing and zero offset. Can these wheels be supplied in bare steel for painting? What cost? 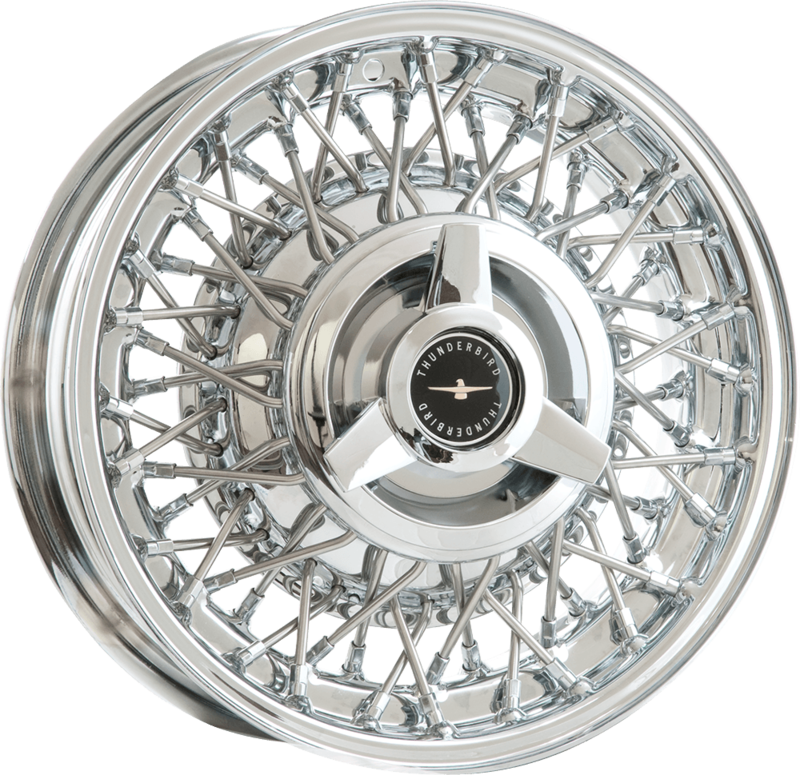 The Thunderbird wheels are only available in chrome. For a primed, paintable wire wheel, see the Hot Rod Wire Wheel - primed.